George Lambert, ‘The charge of the 3rd Light Horse Brigade at the Nek, 7 August 1915’, 1924, oil on canvas,152.5 x 305.7 cm (unframed). Australian War Memorial, Canberra. On a recent visit to the Australian War Memorial, I was surprised at the visual density of ‘classic’ war art. In the paintings of George Lambert (World War I) and Ivor Hele (World War II), the combat is hand-to-hand. The viewer is in the thick of it, given the now-familiar first-person shooter point of view. Soldiers writhe and wrestle, the mud flies and the casualties pile up. Whatever the artists witnessed in the field has been retold in the voices of Tintoretto, Michelangelo and Signorelli. In an age of abstracted conflict—borderless wars, remote weaponry, cyber-attacks—there’s a pervasive air of studied remoteness. The twenty-first century war artist is denied the physicality and materiality of classic war art. 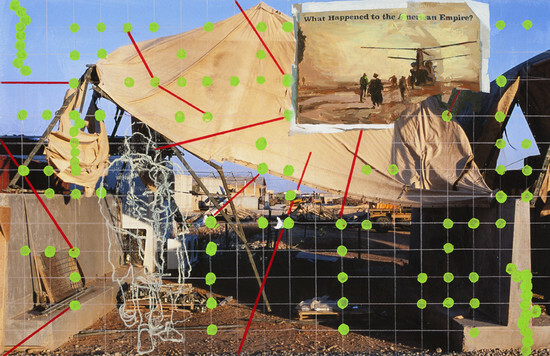 The war artist’s capacity to witness is diminished. The enemy is difficult to name and is often never seen. An embedded artist is restricted to base or escorted on carefully framed tours of secure zones. What the war artist sees is often the aftermath of conflict, narrated from one side of the wire. The story is self-consciously suspended within the managed framework of intervention, ratification and containment. Commemoration substitutes for reflection and is larded with populist investments in national identity. Long-time collaborators Brown and Green were deployed in Iraq, the Persian Gulf and Afghanistan in 2007. Cattapan was posted in Timor Leste in 2008 as part of the International Stabilisation Force associated with the nation’s transition to independence. Their collective experience has been elaborated in Australian Research Council-funded research on conflict art and in their triple collaboration in joint exhibitions at Station and ARC One. Here are some further strategies that I see Brown/Green and Cattapan adopting in their work as responses to challenges confronting conflict art. Through a glass, ghostly: Whatever is seen in the three artists’ work is generally seen through some intervening filter, apparatus or system. Nothing is ever just shown, everything is shown as mediated. The flat, even light of the digital camera is ubiquitous, complemented by the ghostly green of night vision goggles and other scopic mechanisms (radar) and systems (news imagery, topographic maps). Can’t see for looking: The master shot is never delivered; the encompassing view is always denied. Screens, fences, blast walls, tents and makeshift sunshades disrupt large sections of the paintings, blocking out the long view and insisting on the contained, limited capacity of the artists’ gazes. Painted versions of screen data, topographic overlays and vectoral charts drape an informatic haze over photographic source materials. The world is rendered (in the imaging software sense of the word) rather than seen. Like a soldier’s combat wear, the canvases are smothered in disruptive pattern material (itself now digitally generated). And when all else is said and done, opaque veils of paint drip down the surface; not so much a metaphor for blindness as a declaration that image-making is both an act of occlusion and revelation. Far horizons: Any passage into deep space tends to be structured as an incoherent foreground, followed by a leap over a radically-compressed middle ground, ending at an impenetrable mountain range. These are merely the component parts of kind of picture we might call a vista. And they serve, again, to declare that the comprehensive (comprehending) view is not on offer. The many gestures made towards mapping—grids, contours, threading trails—are all unanchored and delivered without a key. A map without a legend is just lines on a canvas, a figure of unknowing. Picture building: Throughout, there are small gestures that speak of a desire to anchor down the structure of the paintings; to ‘true and fair’ the canvas as formalists used to say. Tent poles, stakes and other uprights reach to connect disparate elements into some kind of scaffold. Dots are placed in corners, as if to pin the image down. Grids and hovering rectangles grasp after the stability of ‘deductive structure’; if a logic for mark-making can be discovered in the material presence of the canvas perhaps there’s hope for one in the field. But what this does is make the painting’s surrogate nature all the more evident. The only world it can be sure of is its own; other worlds will be witnessed only in the aftermath of the painting. The third hand: Collaboration brings with it factors that guarantee a ‘failure of clear meaning’. 5 Three different artists using different materials, working at different paces in different locations makes for an art that can never claim to be cogent. There will be no integrated voice, no resolved narrative, no assured witnessing. Instead, all the works will be essays in perspectivism, testimonies to the Nietzschean claim that the world is knowable only to the sense that it is interpretable. And in the contested field of conflict art, that is the place at which knowledge might begin the be developed. I’m not sure I understand or agree with all your stratagems, or find them especially applicable to the work illustrated. The most salient strategy seems to me to be a studied avoidance of any political context. I mean we are talking about wars here, and in a functioning democracy the reasons for such measures ought to remain under constant scrutiny. Now I wouldn’t mind the AWM engaging in a little empire building, in pushing on with new or current projects, if only to mirror the efforts of their masters in government, but lumping together all wars as somehow a routine matter of foreign policy strikes me as not only deeply offensive, utterly disingenuous but finally dangerous. War is not something we should be celebrating, not an area we should be looking to ‘grow’. There are no just causes and none can be shown. And as far as recording or documenting such events, this is something best left to those dedicated to the task or those best placed to witness them. The informal You Tube videos from troops in Iraq and Afghanistan for example, are far truer, more moving and beautiful than anything an accompanying artist could ever hope to contribute. Then again, if all you want to do is kiss the Yankee jackboot and further an evil empire, well maybe the role of Official Whore Artist is for you. You won’t get too close to the action of course, that’s not in anyone’s interest. But everyone will know whose side you’re on, if only as you bring up their rear, appropriately. But you will get a good look at some of the gadgetry, yeah a little formal interest in imaging and graphics and the odd nod to the painterly. So ironic, no? Tells us so much about the embedding process, doesn’t it? Not to mention the pillow biting. It won’t of course touch on the black ops, the arbitrary murder of ‘suspected’ civilians, wholesale destruction of businesses and private property, bribery and off-base trading, extreme renditions and torture that our elite renta-thugs readily facilitate. That might be getting a little too real, a little too biased or political. But the Official Whore Artist is only there for the rides, the gear and the sights, the debrief in brief, the official version and the office virgin. We skip the wounds, the amputations, the infections, addictions, delirium, summary cruelty and abuse, grief and death. That stays in the barracks or the mess failing that the compound or tour. Instead we keep the wars cool, clean and non-committal – above all, a lie. They are, after all, building an image of a nation and clearly it is to be a nation inconvenienced by too much truth. Like calling war a ‘conflict’ – lumping it together with differences of opinion, competing technologies, confusions in behaviour and group therapy sessions on someone else’s problem. It’s so much more detached and comfortable, just calling it a ‘conflict’, right? It’s so much more manageable, so much less brutal and threatening. Oh yeah we buy a conflict over a war any day. But apart from the fatally neutered brief for the Official Whore Artist, where exactly does it stand as art? 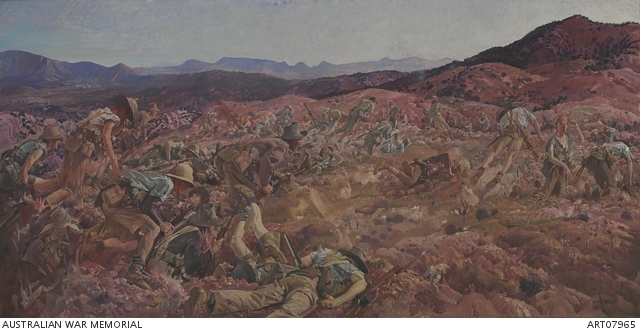 You usefully commence your review considering the works of George Lambert and Ivor Hele and it occurs to me their standing in the history of Australian art surely signals something about the AWM’s preferences. Neither is especially adventurous or experimental in style, even for their time. They were essentially conservative, safe, tasteful. And this is not to consider lesser choices like Frank Norton, Bruce Fletcher and Ken Mc Fadyen. None of whom ever exactly gave Bernard Smith pause. Apparently while serving in the war, the young Sydney Nolan applied for a position as an Official War Artist only to be rejected as too progressive or experimental. Today Nolan looms large in our art history, Lambert and Hele far less so. I think this unlikely to change. And I can’t help feeling the same fate awaits later AWM choices. 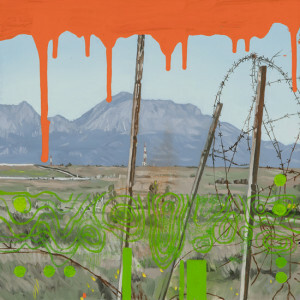 A Rick Amor, Wendy Sharpe, Peter Churcher – we’re not exactly on the first tier of Australian painting here, are we? The stuff is competent illustration not without a certain amount of charm or poetry, but it is fairly perfunctory stuff because ultimately that’s all the AWM can stomach. 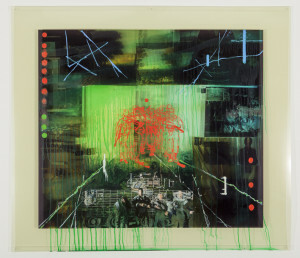 As for Sydney pompiers like Shaun Gladwell or Ben Quilty, well there I think the wars get fitting treatment. Or, the artists and their placements deserve one other. Does a more abstract treatment really give wars of invasion and conquest some more sophisticated or nuanced perspective? I suspect the AWM is comforted by a distanced, designer-friendly approach. But I fail to find anything arch or subversive in this formalism. It strikes me as sterile and spineless. Spooked? You actually need a soul for that. The three artists’ book, ‘Framing conflict’, addresses many of the issues raised in this comment at some length; especially the problems of distance, shepherded and abstracted experience, and the ideologically-driven traffic in war imagery. Having viewed both exhibitions and read the book, I was curious about how they would ‘build’ paintings that responded, in their making, to all of these filters while also avoiding any specious claims to witnessing conflict. And in the back of my mind was the contrast between this project and the works of other recent AWM war artists. Many resort to portraiture and genre-based images of daily life to suggest a kind of intimacy that suggests a faux-witnessing while bracketing off the realities (material and ideological) of contemporary conflict.